A wireframe helps you organize and simplify the elements and content within a website and is an essential tool in the development process. A wireframe is basically a visual representation of content layout in a website design. 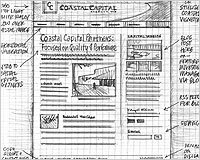 The wireframe acts as a prototype that shows the placement of page features, such as header, footer, content, sidebars, and navigation. It also specifies the placement of the elements within these content areas. If you want to develop a site that accurately matches the client’s requirements and minimize project revisions, wireframing will keep you on track. Simplicity. The key is to keep it simple enough to be clear to the client and to be flexible for the designer, but detailed enough to guide the programmer. As mentioned, you could create a high-fidelity wireframe, but doing this early in the development process could be confusing for the client, who may mistake it for a final draft. Work in grayscale. When creating elements for a wireframe, it’s best to work in grayscale so that you can focus on the layout without being distracted by the design. If you have been given a full-color logo, convert it to grayscale as well. To distinguish between and categorize various elements, show shapes and outlines in different shades of gray. Use wireframes in tandem with a sitemap. A wireframe is a visual representation of a good sitemap, not a replacement. A sitemap is a useful tool for any website and would definitely be helpful to refer to during the development process. Focus on the desired outcome. Have a clear understanding of how your client wants users to respond to the page before creating your wireframe. The calls to action should be very clear simply from looking at the wireframe. Create a full-sized wireframe if it is for a website. This will give the most accurate representation of the actual page. Plan the elements by securing the content in advance. In a best-case scenario, your client will have already supplied you with the elements that should appear on each page, such as the logo, ads, Flash or video players, features, navigation sections, and sidebar, header, and footer elements. If you do not have this information yet, meet with your client and get (or create) a sitemap. If you are re-designing existing elements, you can gather them from a careful review of the website. In this scenario, be sure to first confirm with your client that you will not be required to add or remove elements, because not having a clear understanding of their expectations will slow down the process. Continue reading at Webdesigner Depot . . . This entry was posted on Wednesday, September 16th, 2009 at 7:00 am	and is filed under Best practices, Design, Promote. You can follow any responses to this entry through the RSS 2.0 feed. Both comments and pings are currently closed.